More than five years past the announcement of the Atlantic Yards plan, it's way overdue for a list of common errors made by journalists in covering the project. Some of them recurred just last week and, though they may not seem huge--I've heard many a journalist shrug them off--they generally shade the description of the project in favor of developer Forest City Ratner's permanent campaign. Some on the list lower down are less prevalent, but deserve retrospective correction or should provoke greater skepticism. 1. Atlantic Yards is a place. No, it's a project. On WNYC last Friday, Amy Eddings described a plan that "would bring high rise offices and apartments to the Atlantic Yards in Brooklyn," Atlantic Yards does not exist. 2. The project would be built "over the railyards." No, the Vanderbilt Yard is about 8.5 acres, while the project footprint is 22 acres (originally 21). The Wall Street Journal reported Friday that the project was "proposed for a site above a rail yard at Flatbush and Atlantic avenues. If only the railyard were needed, we wouldn't have a fight over eminent domain. 5. The site received public approval by the city. No, the state process bypassed the City Planning Commission and the City Council. 6. The Atlantic Yards site is the same place Walter O'Malley wanted to build a replacement for Ebbets Field. 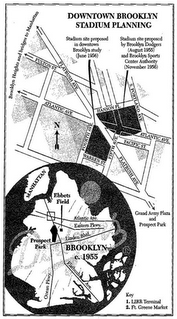 That error has supported some columnists' nice nostalgic turnabout, but O'Malley didn't want to build over (and around) the Vanderbilt Yard, but rather across the street, north of Atlantic Avenue, on land now occupied by Forest City Ratner's Atlantic Center and Atlantic Terminal malls. 7. 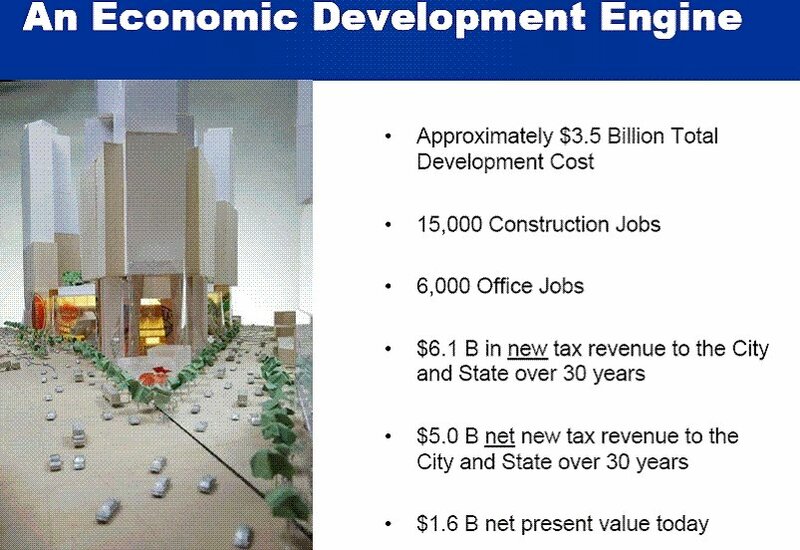 The Department of City Planning (DCP) "recommended" an 8% scaleback in the size of the project in the fall of 2006, as Atlantic Yards approached approval. Well, DCP did write a letter to that effect, the modest reduction--in square footage, a return to the number originally announced, actually--had long been in the cards. Despite the orchestration, even critics of the project mistakenly see the reduction as noteworthy. 8. The project would take ten years to construct. While that is the construction schedule as approved by the Empire State Development Corporation, and the schedule asserted by FCR CEO Bruce Ratner last May, Chuck Ratner, CEO of parent Forest City Enterprises, acknowledged in March 2007 that "we are terrible" about predicting when projects come to fruition and, a month later, I suggested the timeline was a fantasy. Last month, Chuck Ratner admitted that the market would control the pace. Moreover, city and state funding agreements provide a much longer leash, with no timetable for Phase 2; nevertheless, the courts have chosen to believe the official schedule. The deceptive timetable maintains an illusion about the timely arrival of some promised benefits, like the open space and affordable housing. 9. 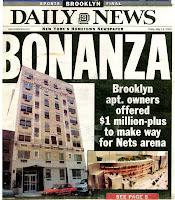 The arena would open in 2006, 2007, 2008, 2009, or 2010--all predictions by the developer dutifully repeated by the press, especially those writing for the Sports section. Just because someone says it doesn't mean it should be reported unskeptically. Now most everyone says 2011. Given the 30-month construction schedule, I say 2012 is a more likely best-case scenario. The arena opening date, confidently asserted by Nets CEO Brett Yormark, may help the developer sell suites and sponsorships, but even some sportswriters are beginning to show skepticism. 10. The developer asserts that the project would include 15,000 construction jobs. No, it would be 15,000 job-years, or 1500 jobs a year for a decade (or, obviously, some other configuration). Some news outlets have gotten better on this one. 11. Fifty percent of the rental housing would be affordable. This is accurate, but it deserves an asterix, because the original plan was for fifty percent of all the housing to be affordable, because the housing consisted solely of rentals. 12. Forest City Ratner added market-rate condos to the Atlantic Yards plan because of a request by "community leaders" (apparently representing low-income residents). This has been reported only once, in the New York Times, but it deserves correction, because "It's Orwellian, almost" and, actually, condos were planned from the start. 13. The project would provide $6 billion in new tax revenue. That was Forest City Ratner's ridiculous estimate of aggregate payments, which would more accurately be represented as $2.1 billion in present value. This error has recurred mostly in editorials, but some reporting is in order to clarify the numbers. The Empire State Development Corporation, in its own flawed calculation (sans expenses), suggested $944 million in present value. Any projections in these cases are suspect and deserve some peer review, which the New York Times has more readily practiced regarding other issues, such as hoops bias. 14. 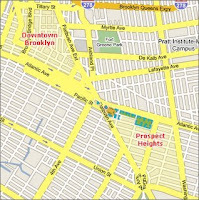 The project would be "almost exclusively privately financed," with all public money coming from incremental revenues and that Atlantic Yards, in Bruce Ratner's words, would “not touch the existing tax base.” No, the public support consists of both direct appropriations and tax breaks with many special benefits, despite the failure of sports economist Andrew Zimbalist, Forest City Ratner's hired consultant, to acknowledge them. There's no TIF, or tax-increment financing, which would've required legislative approval. While the press hasn't repeated these errors lately, it hasn't gone back and held the developer to account. 15. Forest City Ratner paid for generous buyouts that condo owners took. No, the city reimbursed the developer, though we only learned that a few years after the publicity. Again, this deserves a second look. 16. The rival Extell proposal would've included "mostly low-rise buildings." No, those buildings would have been high-rise. 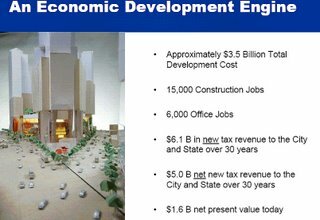 The error exaggerated the divide between the Extell plan and the Forest City Ratner plan. 17. Forest City Ratner "threw in" a new Brooklyn Tech High School as part of the Atlantic Yards plan. No, "work with" was a lot more vague. The follow-up in the Daily News last year still missed part of the story. 18. 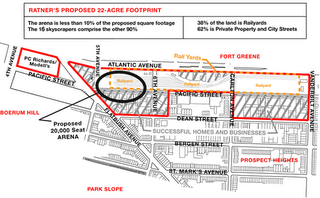 Opponents "lost 20 court decisions" regarding Atlantic Yards. Just because someone says it doesn't mean it should be reported unskeptically. That could apply to other reportage regarding AY, and to a lot of journalism in general. The "Holier than Thou News Report" is on the air. Hey, bobbo! Wow, you certainly seem to be taking this "amateur" criticism to heart! I wonder why...? Isn't there something unethical about a career reporter like yourself hiding his identity on a blog and popping off? Oder certainly seems to have found your range! Wow, more straw from Bobbo man. There is nothing holier than thou in correcting errors. Is the corrections section of the NY Times called the "holier than thou" section? What a silly thing to write. Thanks for the comment on the Greenportvillage blog. Made the correction.